It is a mistake to assume that all precast concrete wall companies are the same. Companies vary widely levitra dosage instructions in their assembly approach, the materials they use, and the lifespan of their products. If you want to avoid the extra cost and hassle of a do-over project, forging a good relationship with a reputable precast concrete casting company is totally worth its weight in, well, concrete. Here are several important questions to ask. Does the Company Make Their Own Molds? they do, the standard in the industry is that fence sections are only textured on one side, leaving the other side without texture or character. StoneTree® Precast Concrete Fence Wall sections are vertically cast, ensuring that each side of the fence has a highly defined brick, block or stone texture on BOTH sides. Plus, our casting system manufactures the fence panel and column as one piece versus two, lowering cost and manufacturing time. Where is the Precast Concrete Made? StoneTree® fence panels are made in a manufacturing plant certified by the National Precast Concrete Association, using standards that ensure durability and consistency. Many companies manufacture their walls onsite. This increases time and costs, as well as increasing the amount of space needed. Our exclusive ComboCast™ patented technology produces a monolithic casting, with the wall panel and column integrated into a single unit. This makes a superior product structurally, and simplifies installation dramatically. 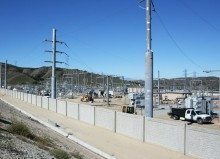 Fence walls can either be manufactured on site with only one casting machine or can be made in our warehouse and then shipped to the job site without special transport racks. What Is the Concrete Company’s Track Record? Is the Concrete a “Green” Product? StoneTree® Precast Concrete Fences are made of environmentally-friendly concrete, and do not interrupt the delicate balance of nature. Our concrete fences go up quickly, significantly minimizing the amount of time heavy machinery has to be in action to complete the process. 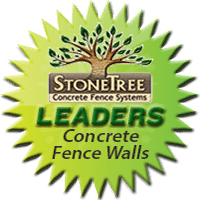 StoneTree® offers high-quality, low-maintenance concrete fencing, which provides beauty, strength, protection and durability and will stand strong for generations to come. This also means you won’t have to spend time or money replacing it, and again reduces the environmental burden of manufacturing additional materials for repairs or replacements. Installation matters, because it can either drain you of time and money or move quickly and efficiently so you can move onto bigger and better things. Due to fewer footings and larger panels, StoneTree® installation processes require 50 percent less labor. The production area is significantly smaller than competitors, who require separate forming systems for casting panels and columns. Our walls do not require bracing, but are strong https://www.acheterviagrafr24.com/viagra-ordonnance/ and sturdy as soon as they’re placed. With StoneTree®, walls that were once drab and plain concrete block now feature textures and patterns that have the appearance of natural stone, split face block, stucco, river rock, and many others to compliment surroundings. Plus, customers have limitless color options. Not all companies can say that. Some companies offer more support than others. While it’s important to meet the requirements of city and county codes, some companies are far more lax than StoneTree®. When looking for a great precast concrete company, ask about other services, such as supplying architects or engineers with project-specific shop drawings and calculations. We also work with them to create custom finishes, textures and colors, realizing their vision of the project. If StoneTree® sounds like a company you’d like to work with? Get in touch via our website or call 801-281-2262.